Enterprises are continually looking deeper into their operations and farther across their supply chains for opportunities to become more efficient and more cost effective. RFID Labels have proven a viable solution for true asset visibility and tracking in many industries and a variety of applications. Easy Deployment — One of the benefits of RFID labels is the ability to print and encode right on site. In an era of constant change and a demand for immediate action, the ability to print and encode on demand using your own unique data is often a desirable feature. 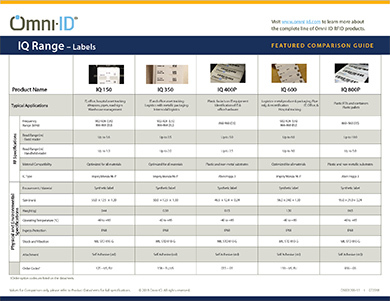 Omni-ID’s IQ labels are compatible with many of the top RFID printers on the market (unlike some label manufacturers that design their labels for use on one printer only). To take advantage of the ease of Print, Peel, Stick, see the Omni-ID Sato and Custom ZT410 Printer Guides and Videos for easy setup. Need your labels deployment ready? Omni-ID is happy to print and encode them for you as well. More choices, more product options — Label products have certainly evolved and improved over time! On metal labels now include options for over-laminate, adhesive, custom sizes and color printing and encoding. Omni-ID offers a broad portfolio of on-metal and off-metal RFID labels. Several encoding options will also ensure your customers obtain optimal privacy, performance and memory benefits to address their specific application. Lowest price — Labels are highly cost effective! Labels typically start at cents on the dollar and increase cost as you increase options and/or customizations. With read performances ranging near 10 meters, labels are a cost-effective choice for many light industrial and IT applications. Omni-ID labels are typically list priced 20-25% less than competitive products. Bring us a competitive quote for a similar product and we’ll beat it! Maybe you haven’t considered using RFID Labels in these applications, until NOW! Visit our website for more information and take a look at our success stories to learn more! next post: Mapping a Digital Transformation for Your Business? Start Here.